I’ll show you how to make the best nachos and 3 different ways to do them up! 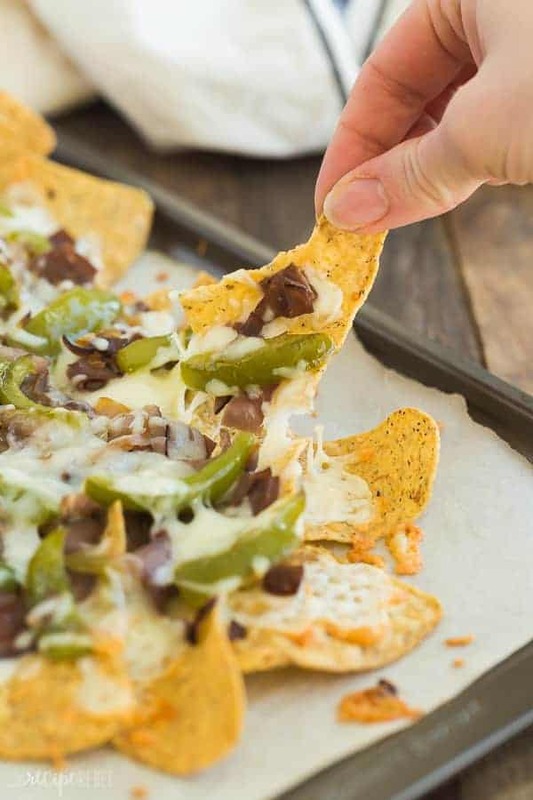 Nachos are a crowd favourite every Super Bowl, game day or family movie night — an easy appetizer or easy dinner that everyone loves! 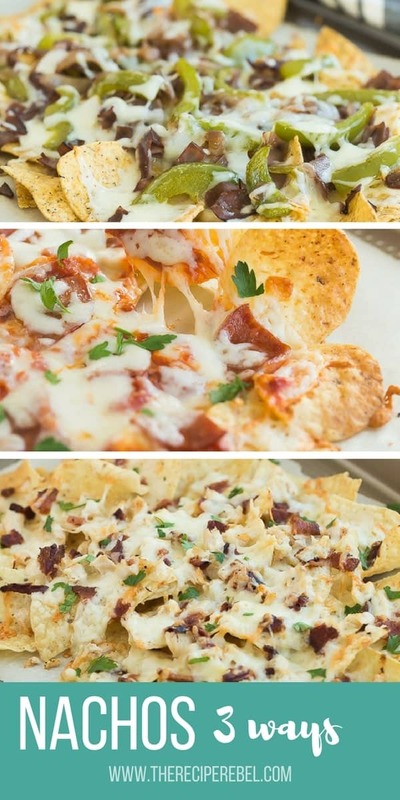 Skip the regular ground beef in favour of these Pepperoni Pizza, Philly Cheesesteak, or Bacon Chicken Alfredo nachos. But if you can get over your shock I promise you, you won’t regret it. Regular beef nachos are great, sure, but put a tray of these on the table for your Super Bowl LII party? I guarantee you you’ll be the real winner 😉 (<– too much??). I confess, I’m a bit of a homebody. But I love having people over. What I don’t love? Spending all day in the kitchen and missing out on all the fun! 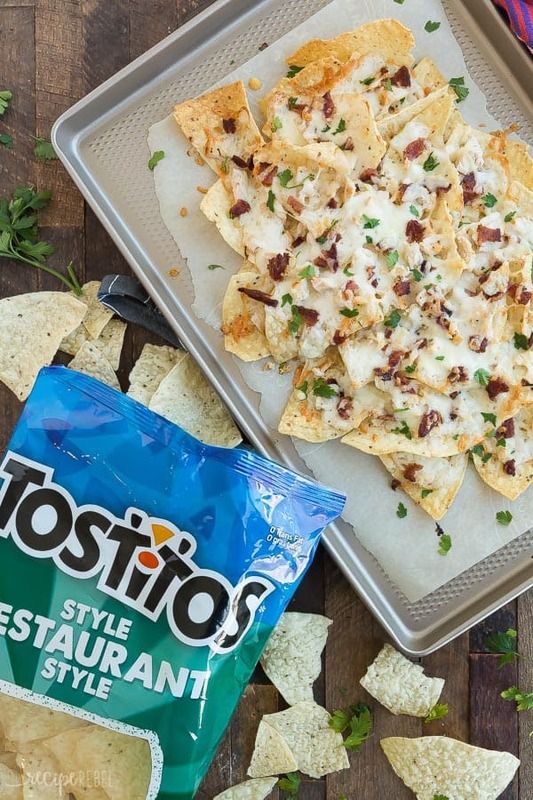 Nachos are one of the easiest things to whip up for Super Bowl snacks or a quick weeknight dinner — just grab a bag of Tostitos, some cheese and whatever toppings you can find. I love to load mine right up so we can count them as dinner (and who’s not down for a handheld meal??). Start with a big, rimmed baking sheet and a piece of parchment paper — you don’t want any of that cheesy goodness being left behind on the pan! Add the cheese before your other toppings, and a little on top for good measure — If you are adding a drizzle of sauce like I have on these, the cheese keeps the chips from getting soggy and acts as glue to make sure every bite is loaded! Mix things up — no need to stick to any recipe! Add veggies, meats, and different cheeses to make them your own. I'll show you how to make the best nachos and 3 different ways to do them up! Nachos are a crowd favourite every Super Bowl, game day or family movie night -- an easy appetizer or easy dinner that everyone loves! 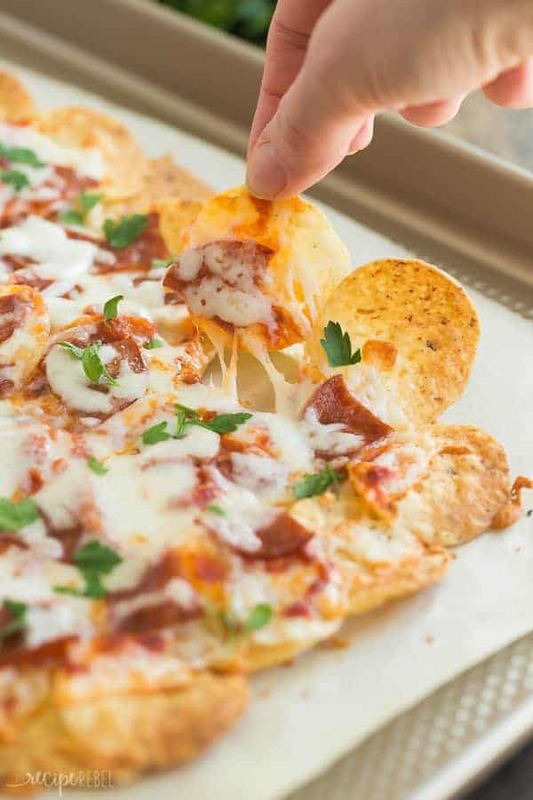 Skip the regular ground beef in favour of these Pepperoni Pizza, Philly Cheesesteak, or Bacon Chicken Alfredo nachos. Spread one layer of Tostitos on the parchment and sprinkle with 1 cup of shredded cheese. Place sauce in a small ziploc bag and snip the end so there is a small hole. Carefully drizzle the sauce over the cheese (you don't want any globs!). Top with bacon, chicken, remaining 1/2 cup mozzarella cheese and Parmesan cheese. Bake for 10 minutes or until cheese is melted. Serve. Top with pepperoni and remaining 1/2 cup mozzarella cheese. Heat oil in a medium pan. Add peppers and onions, stir and cook until completely softened. Top chips with cooked vegetables, beef and remaining 1/2 cup mozzarella cheese. 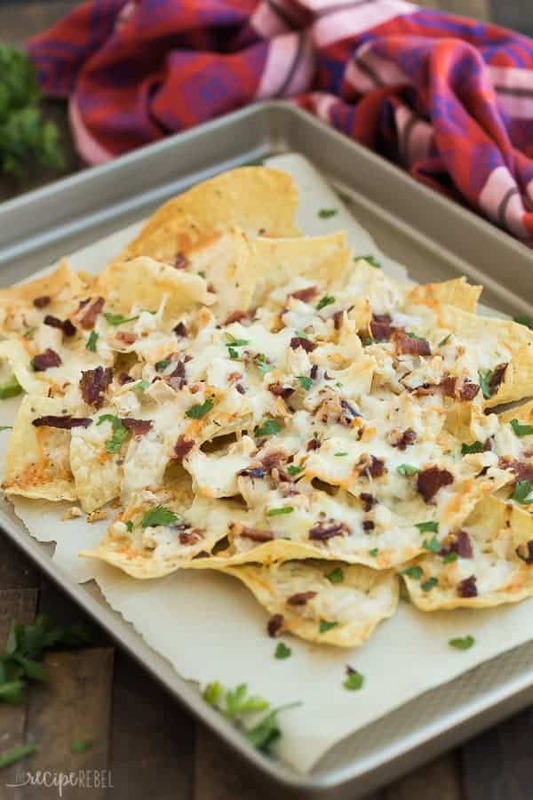 Those bacon chicken alfredo nachos sound awesome. I mean they all sound great. I love pepperoni too. And philly cheesesteak. WHICH ONE DO I MAKE?? LOL! Nachos really are the best! Lol! It’s a toss up!